On this Sunday morning, for many hours, Therese helped to extinguish a fire. She stood on a stool and raised buckets of water, about 10-15 kg each, up to the next higher point. After two hours of difficult work, by this time completely wet and exhausted, she felt all of a sudden a piercing pain in her back, the bucket with water fell out of her hand. She could walk only stooped and with severe pain - with the feeling, to have no support from her back. In spite of remaining weakness and pain, at first no one thougth this working accident would have any long-term consequences. She herself tried to work as much as possible. In the same year, several other accidents happened, some of them were serious. At the beginning of April 1918, when carrying a sack of potatoes, she fell backwards down the basement stone stairs. Since no improvement of her physical weakness could be reached at home, Dr. Göbel transfered her to the hospital. The diagnosis 'Gastroptose' (pathological stomach position) was treated with bed-rest and fasting; drinking milk was the only nourishment. For most severe pain, starting in her back and radiating to the front, the Doctor gave morphine. No other drug gave any relief. After more than 7 weeks, she went home without being cured. The doctors obviously could not assess her situation, so they used a noncommittal diagnosis 'Hysteria Traumatica'. It has to be considered that the diagnosis 'Hysteria' had not the definition of today, but is to be understood against the background of the sciences of that time (Klosa, p. 55 ff). Therese tried to work as much as possible, so another accident happened on August 1, 1918: she fell almost 2 m (ca. 6 ft) backwards down the ladder and remained unconcious on the floor. In consequence of these accidents, her health deteriorated considerably. After an influenza in October of the same year, she was so weak that she had to stay in bed, eventually she could not even sit up in her bed anymore. She was completely dependent on the help of her family. In the following month, she suffered additional spasms and reflexes in different parts of the body. A spasm in her jaw-joint caused a bite, which damaged all incisors and led to the festering of gums and jaw bones. Since summer 1918, she had experienced occasional 'swimming' of her eyes; in March 1919, complete blindness occurred. A few weeks later followed a humming in the ears, auditory troubles and eventually deafness. Therese, originally vital and physically strong, was completely blind, deaf, suffered from tormenting pain and involuntary spasms, in addition to endured foul-smelling wounds [decubitus - because she was confined to bed]. After all medical treatment had been in vain, all hope for some improvement of her condition vanished. Several times her death was expected. In this situation, Dr. Seidl, who had treated her since 1919, filed an application for disability pension after an accident at work, to help the family in their also economically tight situation: "Most severe Hysteria together with blindness and partial paralysis. The illness is considered to be a consequence of the accident. According to everybody´s statement, before the accident happened, the patient had been an absolutely healthy, extremely strong and hard-working girl, worked like a male farm labourer, and comes from a family without any hereditary disease, only after the accident, the illness started" (Klosa, p. 27). Although it was not possible to place her illness in an exact category, the following physical problems were so obvious, that a full disability pension was granted. 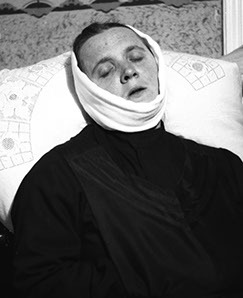 Therese´s physical deterioration proceeded further. Paralysations developed, mainly on the left side. According to Dr. Seidl, not even with the strongest electric current-stimulations was any stimulation achieved. From 1922 on, these paralysations affected also her throat muscles, swallowing was difficult. Moreover, again and again she had ulcers in her throat with severe swellings, so at times she could not eat anything, breathing was difficult. The year 1923 brought a decisive turn. On April 29, 6 o´clock in the morning, suddenly, Therese could see again, at the same time the pressure and pain in the back of her head disappeared. Since she had turned blind 4 years and 1 month ago, several medical and non-medical treatments had been unsuccessful. Later it was learned that this had happened exactly on the day of the Beatification of Therese of Lisieux, whom Therese Neumann revered much. About two years later, on May 17, 1925, the day of the Canonization of Therese of Lisieux, Therese Neumann all of a sudden could sit up again and walk around with little steps. No medical explanation could be given for this sudden and unexpected healing of her paralysis, as well as for the further improvement of her physical strength after September 30, 1925, so she was able again to walk all by herself.